Have you ever had someone share a tip or trick to something you do all the time the just makes it a billion times easier? Well today I’m sharing my secret tip, pssst it’s actual a tool, for easily turning fabric tubes and other odd shapes like fun pockets right side out. But the brilliant thing is that I use it for so much more than just turning! When I first learned about this contraption I felt like my mind was exploding. 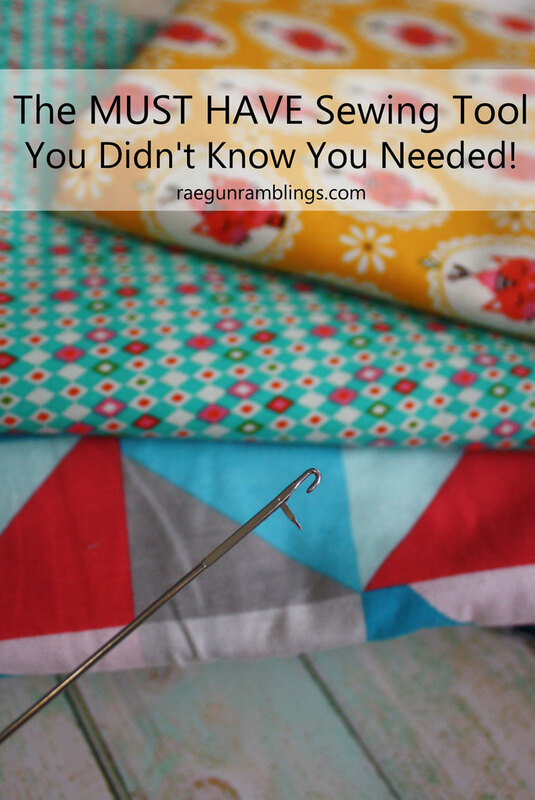 I cannot tell you how much time this must have sewing tool has saved me over the years. 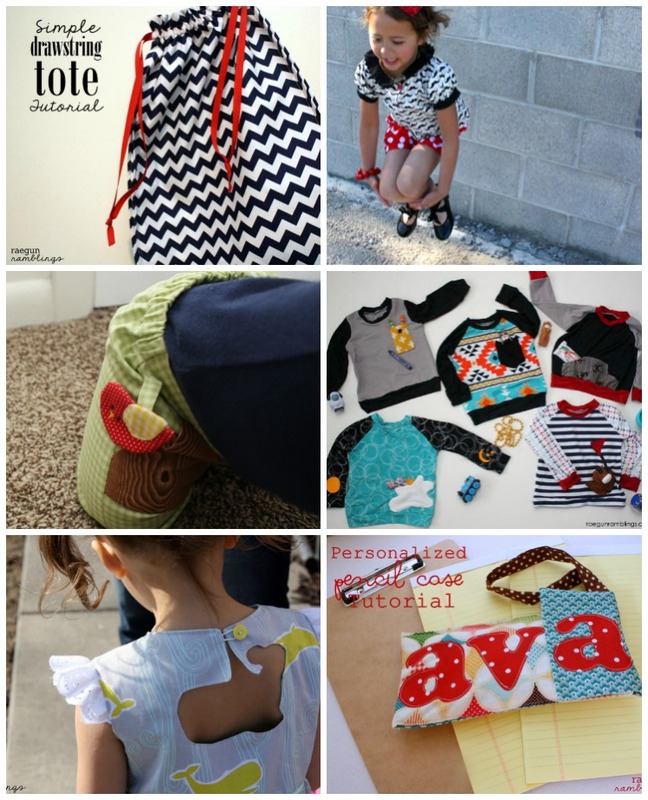 Between my business, the blog, and sewing for family it’s been many MANY hours. I use it in SO many projects! Almost every time I sew I use this and I’m not even exaggerating. I used it twice today. 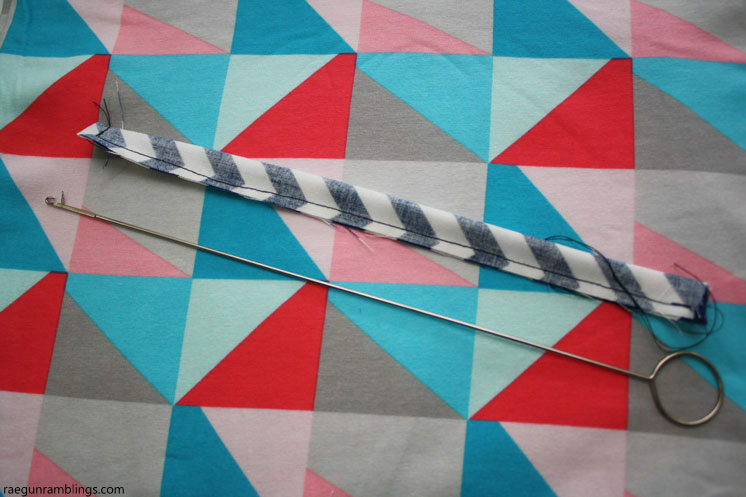 I had been sewing for quite a while and comfortable with my clunky safety pin method that sometimes got swapped for my equally cumbersome chopstick method when someone finally introduced me to the loop turner. Have you ever used one? I hadn’t even heard of the tool and most of my crafty friends are in awe when I introduce them to this fabulous thing. I figure there’s got to be other people like me who need this tool in their lives. 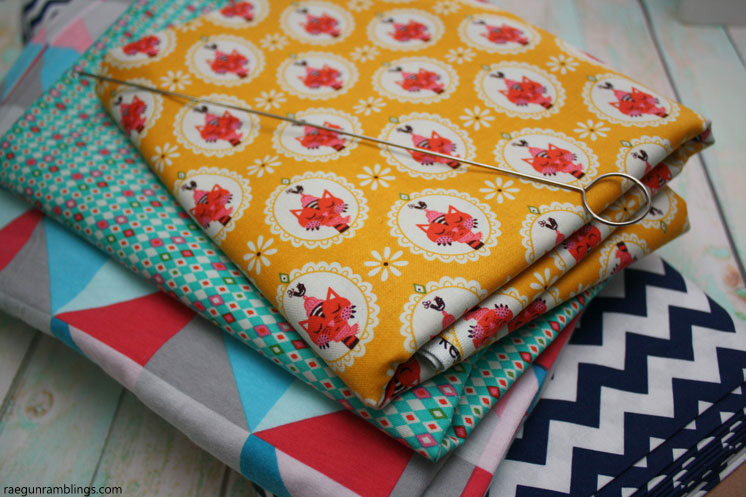 They work great on all kind of fabric from woven cottons like the fun Vintage Kitchen prints (Kitchen Harlequin Teal and Kitchen Cat Yellow) shown here or the basic Navy Chevron as well as knits like these Idle Wild Triangles in blue. A loop turner is a thin stick with a small hook at one end and circle for your thumb at the other. You insert it into items you want to turn, hook it through some fabric and it gives you the leverage to pull it right side out. It works GREAT for tubes like I mentioned but I’ve also done this trick with pillow cases, fun shaped pockets and more. Stick the hook end into whatever you’re trying to turn. 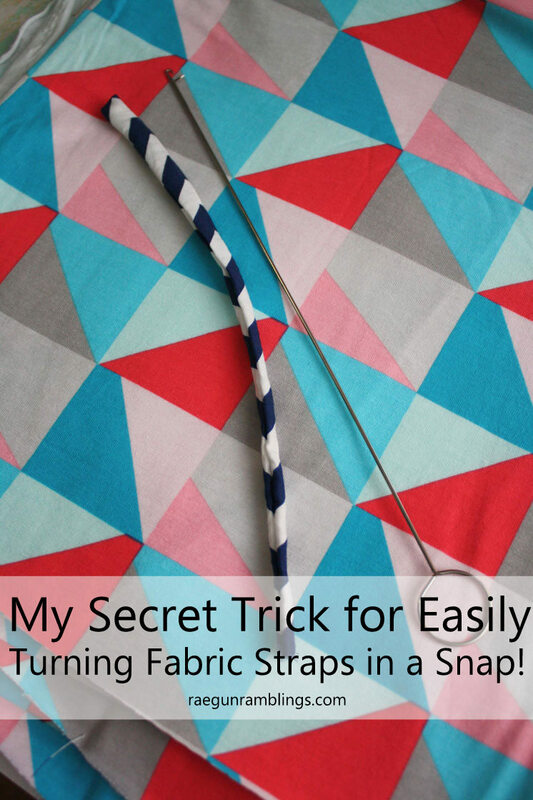 Feel around through the fabric and make sure the flap is open then press the hook through your fabric. With your thumb of your dominant hand (for me it’s the right) in the circle end of the loop turner pull a little with your right hand and with your left hand massaged the fabric over the stick to get the turning started. Gently pull with the right hand until the right side of your item is free. You can continue pulling with the loop turner but I like to do as little as possible so that I don’t get impatient and pull a hole in the fabric. Then I just finish pulling the fabric over itself with my hands. I made a quick video since it’s might be hard to picture words and still images. When you see it in action it makes way more sense! You should keep in mind that using the loop turner takes practice. It’s kind of a weird thing and there is definitely a learning curve. It might be SUPER frustrating at first but I promise you it’s worth the small initial investment because the time and effort it will save you down the line will be huge. You can find a loop turner at any fabric store or even on Amazon. Lots of Ways to Use a Loop Turner! Turning tubes of fabric. This is especially good for skinny tubes like spaghetti straps that are hard to get safety pins or chopsticks in. I used it in the loop for these fun pop up bird baby pants and the small strap of this pencil case and large strap of this reversible book bag. Turning any thing right side out that is hard to get your hand into. I use this for the cloud pockets and little boat pockets on my pockets tweaks post. Pulling ribbon or elastic through casings. It doesn’t on small circular casings but if it’s large enough or a straight casing like in this super easy drawstring bag it works great. Getting the shape of an item right after turning it right side out (for example peter pan collars, the crazy whale cut out on my nieces’ Easter dresses or the pockets and bird details I mentioned above). You can stick the end in to help fully round out, curves pop out corners, etc. I first shared this post on the Riley Blake Designs blog on 3/2/2016. Yes it’s SO worth it (plus they are VERY inexpensive) it has a learning curve but well worth taking the time to figure it out. 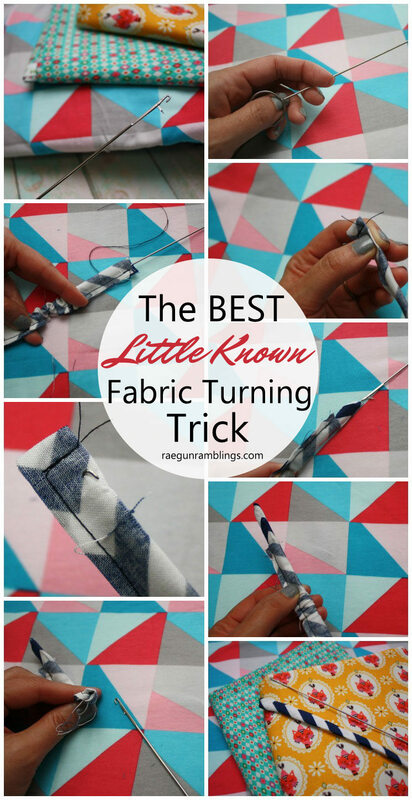 I love using it to run the ends of the serger threads into the seam! Just slide it out of the last inch of serged seam, hook the end of the chain and slide it back through- nice and secure! That’s one of those tricks I’ve been meaning to try thanks for the reminder! Do you have a video showing how to do this? Do a search for “Bobkin”. There are different kinds, some of which are very flexible. I use the rounded end to push out a seam that I am ironing. I make baby bibs and when I turn them right side out the seam is not flat. I can stick this tool in between the the front and back layers and iron at the same time. Works great! Hello, When trying to look at the (Kitchen Harlequin Teal and Kitchen Cat Yellow)… Navy Chevron .. Idle Wild Triangles in blue etc. I get “The page you are looking for might have been removed, had its name changed, or is temporarily unavailable.” Perhaps I’m doing something wrong? Thanks!